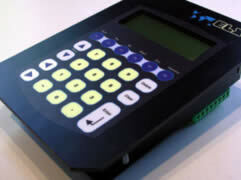 These compact keypad terminals have a backlit display and sealed, configurable keyboard. They are engineered for general operator interfacing, machine monitoring and data collection applications in the industrial environment. The 4 line x 20 character display supports direct cursor positioning, cursor on/off and an extended character set. Additionally the Graphic Tool can create up to 8 user-configurable characters. The IO option adds 2 relay outputs and 4 opto-isolated digital inputs. 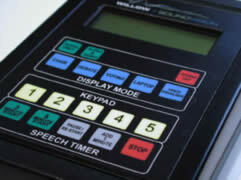 Each input can also count at up to 250 cycles/second and the cycle time measured. The status of each input or counter can be requested by the host system or sent automatically when the input changes. Quick-Start kits include the User Guide, Power supply, PCtools for configuring and testing, and all cables. 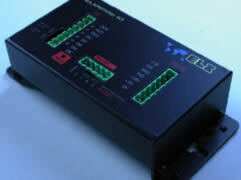 The RS422 version uses opto-isolated signalling for robust operation in difficult conditions. These products are offered in 4 configurations. The ELX is the panel mount model but is also suitable for wall-mounting when fitted to the WMX wall-mount enclosure. The ELD version is intended for desk-top use. The ELX232Node (and ELX422Node) offers the same input and ouput capability without having a display or keyboard. All use screw terminals to simplify connection. The keypad terminals are available with customised front panel overlays at no extra cost (when specified at the time of manufacture). Graphic templates can be downloaded from our website to be configured directly by the customer in full colour. By adding a logo and creating new key legends, changing colours etc, the look of the product is transformed to the customers standard. Digital print technology outputs directly to polyester keyboard membrane using non-fade inks and reverse printing for scratch resistance and durability. How to order a custom front panel overlay. 3. Make the changes and save the file, then email to us (contact us using the enquiry submission form). We will check it, assign a unique reference number, and return a confirmation to you for approval. 4. Return this form back to us indicating it's OK for manufacture to proceed (or advise any further changes needed). Once we have your approval we will make the product with your design on the front panel.